For today’s $5 Friday I am pleased to present a guest blog post by Kirsty Young from Make it, Bake it, Snap it. Kirsty has such beautiful and inventive recipes, and I am so pleased that she accepted the $5 Friday challenge. 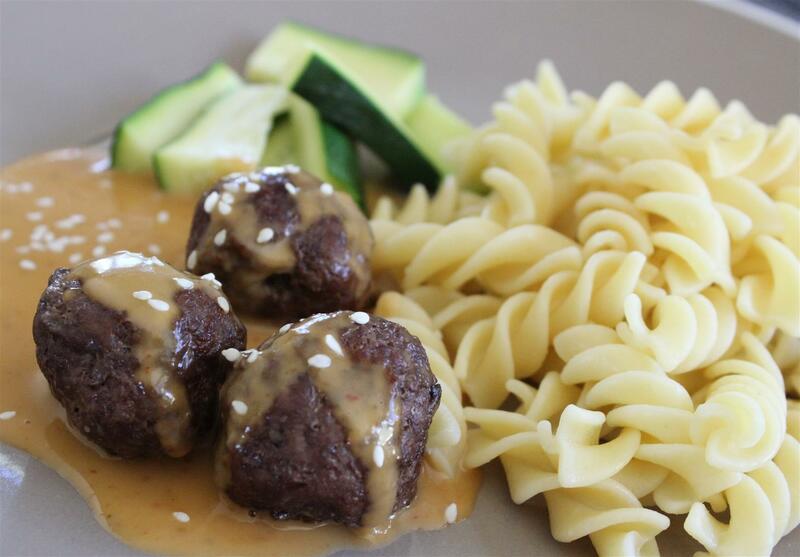 These meatballs are both comfort food and a little bit different. She demonstrates how buying in bulk and thinking outside the square you can save money and enjoy quality food. “When Serina aka Ms Frugal Ears gave me the ‘rules’ I thought ‘oh my’, this is daunting. I wanted to try my hand at doing a balanced, tasty meal that served four people, made in total for $5 or less. Eeek! I had to put my thinking cap on. The week before I had visited Costco, and purchased some of their premium mince. Once I actually sat down and calculated the cost of the mince, it is a really good deal, and quality mince. The mince works out at $7.99 per kilo, but came in a 2.7 kilo block. That’s the thing about Costco. Some good deals mean you need to purchase a large amount, but having room in the freezer, meant that I could portion the mince into meal sized amounts and tuck it away for future consumption. From this mince, I took 300 grams and rolled it into walnut sized balls. I figured that 300 grams would stretch to feed four people, which equated to three meatballs each. I also wanted to pair the beef with a really tasty, vibrant sauce, so I opted for a homemade red Thai Curry sauce inspired by Rasa Malaysia. I added a single vegetable and a serve of pasta. I wouldn’t call the meal entirely balanced, but it was very tasty and filling. Preheat oven to 175 degrees (fan forced). 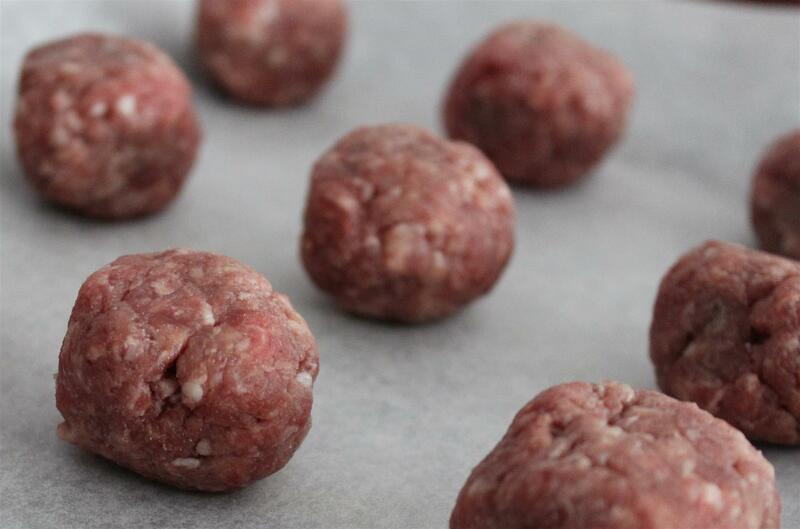 Roll the beef mince into small balls, approximately walnut sized. You want to end up with 12 balls (3 per person, as dish serves 4). When the oven has reached temperature, place the meatballs onto an oven tray lined with baking paper. Cook for 10 minutes, then turn the meatballs over and cook for a further 10-12 minutes until browned all over and cooked through. 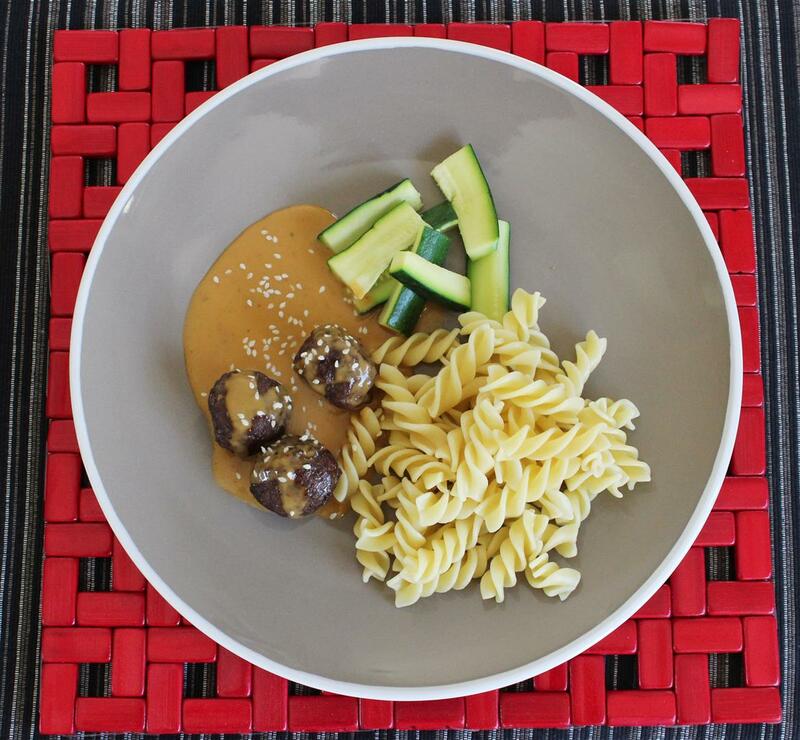 While the meatballs are cooking, cook the pasta until al dente. I find that Homebrand pasta is done in 12 minutes, no matter what shape of pasta is used. To make the sauce, place the coconut milk, brown sugar, peanut butter and curry paste into a small saucepan. 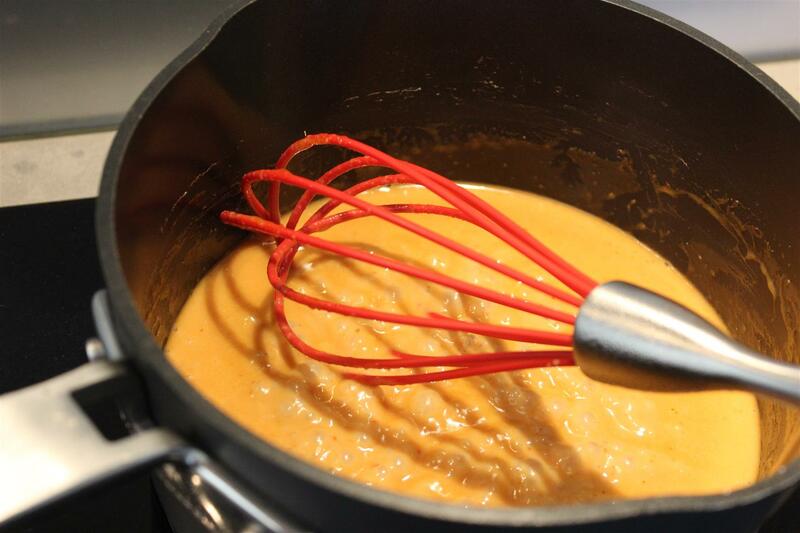 Heat to medium and using a whisk, ensure all ingredients are warmed and melted. Simmer for approximately 7-8 minutes until thickened slightly, whisking frequently. Cut the zucchini into large sticks, and microwave or steam until lightly cooked. 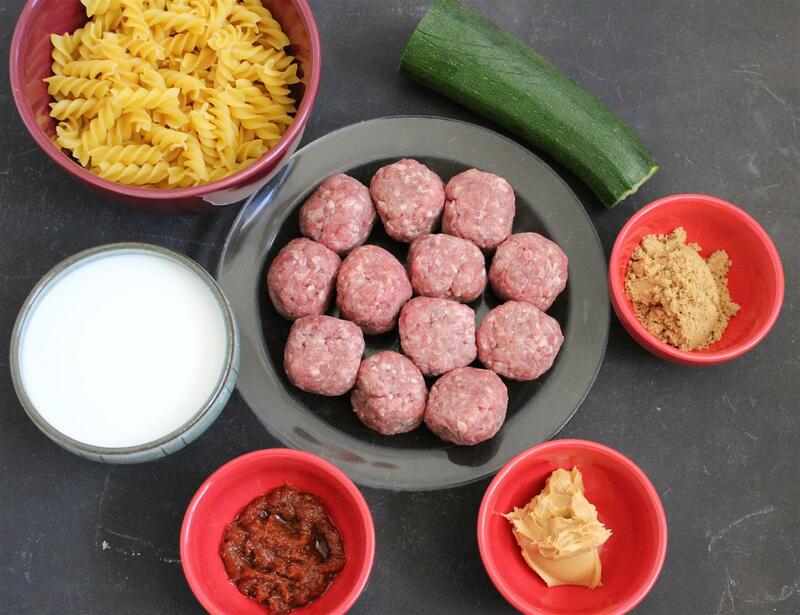 Plate up the ingredients, pour the sauce over the meatballs and sprinkle over a pinch of sesame seeds. This guest post is brought to you by Kirsty Young, the Canberran behind the Make it Bake it Snap it food blog. A blogger for just over a year, she is an avid home baker, general all round food enthusiast and passionate photographer. Married to a Queenslander, step mum to two wonderful (adult) kids, and owner of a cheeky Burmese fur baby. Ms Frugal Ears welcomes other bloggers to take up the $5 Friday challenge. Do you have what it takes to come up with a recipe for $5 or under? Agreed, the mince at Costco is a good purchase! I will have to go to Costco soon and stock up.